Trump and Bernie can agree on one thing: they’re both worked up about the cost of prescription drugs, and they’re not alone. 80% of Americans believe that drug prices are unreasonable. Are they right? Why do medicines cost so much in the US? Why can’t the government negotiate drug prices? What can be done about it?? Come hear the thoughts of health care experts. Ask questions on current policies. Vivek Ramaswamy (College ’07) is an American entrepreneur in the biotechnology sector. He is the founder and CEO of the pharmaceutical company Roivant Sciences, founded in 2014 and now valued at $7 billion. Roivant aims to improve health by rapidly delivering innovative medicines and technologies to patients. Peter Kolchinsky (Ph.D ’01) is co-founder, Managing Director, and Portfolio Manager of RA Capital Management, a multi-stage investment manager dedicated to evidence-based investing in healthcare and life science companies. He is active in both public and private investments in companies developing drugs, medical devices, diagnostics, and research tools and serves as a member of the Board of Directors for a number of private companies. He is the author of “The Entrepreneur’s Guide to a Biotech Start-up” and the Biotech Social Contract series. John Maraganore is the CEO and Director of Alnylam Pharmaceuticals, a biopharmaceutical company focused on translating RNA interference (RNAi) into a whole new class of innovative medicines. He has been responsible for company franchises across oncology, and cardiovascular, inflammatory, and metabolic diseases and led the discovery and development of Angiomax™. He currently serves as the chair of the Biotechnology Industry Organization (BIO) and on the board of Agios Pharmaceuticals. Shawn Bishop is the Vice President for the Controlling Health Care Costs program at the Commonwealth Fund, which aims to promote a high-performing health care system that achieves better access, improved quality, and greater efficiency, particularly for society’s most vulnerable, including low-income people, the uninsured, and people of color. Previously, she provided strategic consulting related to Medicare and the Affordable Care Act, including policy development and outreach to Congress and the administration. Bishop earlier served as senior vice president of research for the Marwood Group, offering financial services firms and others analysis of political, legislative, and regulatory environments, and as professional staff with the U.S. Senate Finance Committee. Ideation is an annual event during which the Harvard and MIT communities come together to discuss commercializing science and the plethora of funding and development groups dedicated to biotech. 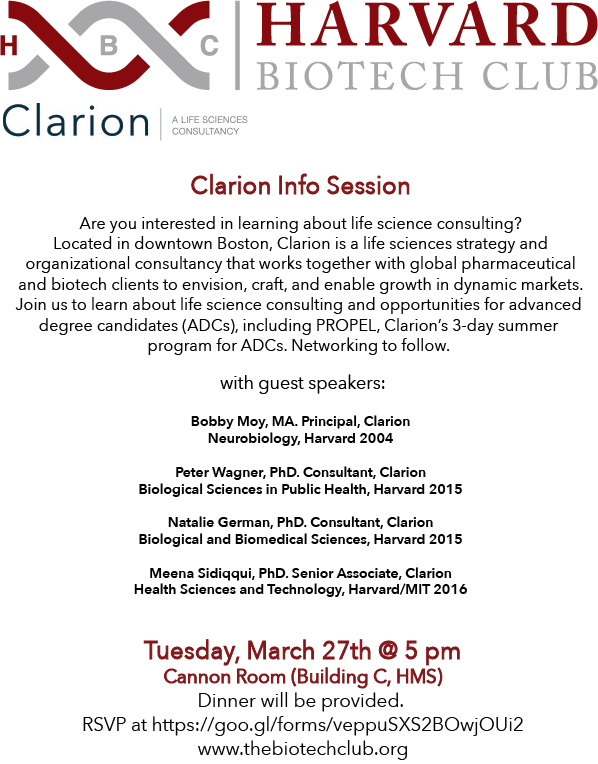 Open to anyone in and beyond Boston, attendees will hear from an experienced executive and educator in biotechnology, 2 successful and established student-based teams out of Harvard and MIT, and a series of 2-minute pitches from selected newly formed teams looking to recruit members and share their vision. Immediately following the event content, at 7:45pm, there will be a networking session with food provided during which students can learn about biotech startup resources from representatives of our partnering organizations, meet pitching teams, and discuss potential future involvement or collaboration. Dr. Robert S. Langer is the David H. Koch Institute Professor at MIT and is considered “one of history’s most prolific inventors in medicine”. He has authored more than 1,400 articles and has over 1,300 issued and pending patents worldwide. Dr. Langer is the most cited engineer in history and has licensed his patents to over 350 pharmaceutical, chemical, biotechnology and medical device companies. Dr. Langer has received numerous major awards and medals including the United States Nation Medal of Science (2006), the United States Nation Medal of Technology and Innovation (2011) the Lemelson-MIT Prize (the world’s largest prize for invention) (1998) and he was recently named one of five U.S. Science Envoys for 2018. As a Science Envoy for Innovation, Dr. Langer will be focusing on novel approaches in biomaterials, drug delivery systems, nanotechnology, tissue engineering and the U.S approach to research commercialization. Armon Sharei, PhD is the founder and CEO of SQZ Biotech. SQZ biotech uses a proprietary CellSqueeze platform that emerged from Dr. Sharei's work in the Langer and Jensen labs to develop a new generation of unique cell therapies. Armon was awarded the 2017 Young Innovator award and has been named to Forbes 30 Under 30 and Endpoints 40 under 40. SQZ won the $100,000 grand prize in the 2014 MassChallenge and has a billion dollar deal with Roche. If you have any questions, email us at mitharvardpitch@gmail.com. Please join us for the 10th Annual UMCA Agroforestry Symposium exploring innovation and entrepreneurship in the life sciences scheduled for January 30-31, 2019. Dr. Rodolphe Barrangou, Professor of Food Science and the Todd R. Klaenhammer Distinguished Scholar in Probiotics Research at North Carolina State University. The 2019 Symposium will also feature panel discussions on themes of entrepreneurship, translation of research and building effective university-industry partnerships, a poster session, closing reception and an exhibit hall showcasing examples of successful entrepreneurship and commercial development emerging from both MU research and collaborations from around Missouri. 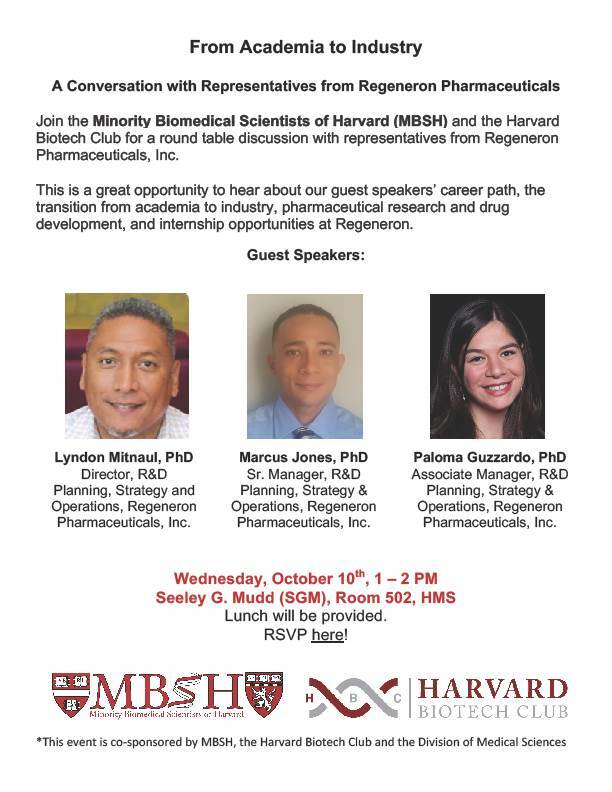 Interested in a scientific or medical career away from the bench? 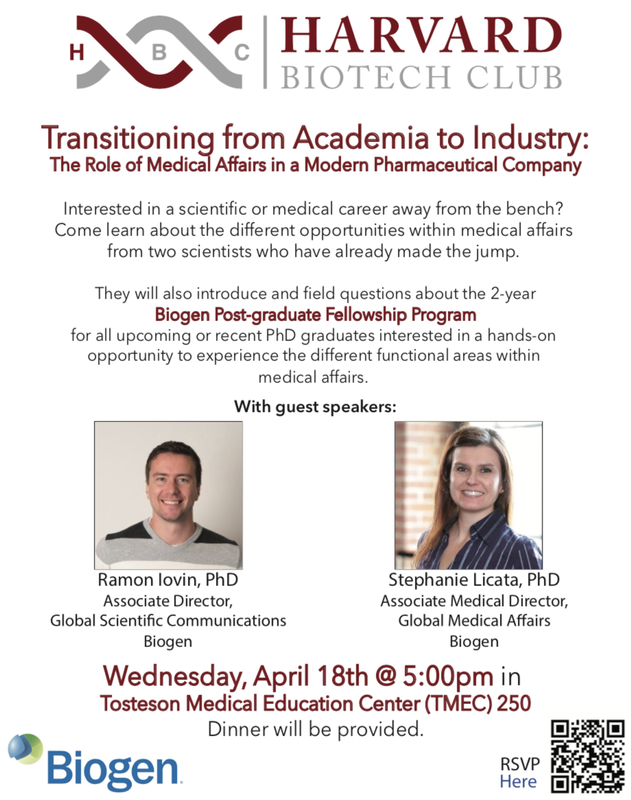 Come learn about the different opportunities within medical affairs from three scientists who have already made the jump. They will introduce and field questions about the 2-year Biogen Postdoctoral Fellowship Program for all upcoming or recent PhD graduates interested in a hands-on opportunity to experience the different functional areas within medical affairs. Breakthroughs in genetics have often raised complex ethical and legal questions. Many regard their genetic testing and sequencing as revealing something intensely personal and private. The questions raised by these technologies loom even larger as genetic testing is becoming more commonplace, affordable, and comprehensive. At the same time, advances in CRISPR and other related technologies raise anxieties about the implications of editing our own DNA. One can imagine a future when gene editing may become as widespread as genetic testing is today. As genetic technologies become more accessible to individuals, the ethical and legal questions around the consumer use of these technologies become more pressing. This conference will examine some of these issues.